In time for this year’s national Empty Homes Week (15 – 21 October), the Ben Street regeneration project in east Manchester has begun to welcome new residents to the east Manchester neighbourhood. By the end of the year, the Ben Street project will see 62 empty homes acquired by the City Council refurbished as well as facelift works to another 151 properties, with other improvement to the street and public areas, including works to shared alleyways. The works are being carried out by Wates Living Space and the first 24 homes have now be handed over to the first lucky residents. 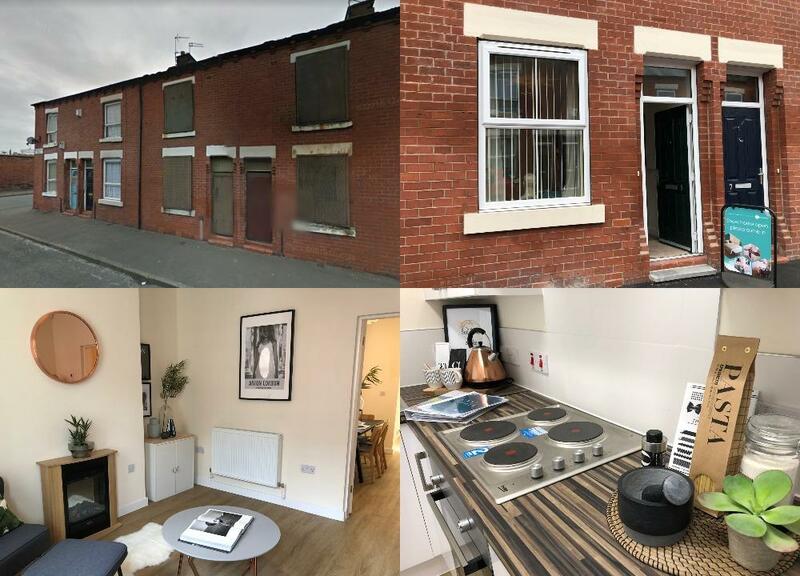 The properties meet Manchester’s affordability definition* and in addition, One Manchester has bought and is refurbishing five more properties in the area for affordable rent, which will be let through Manchester Move to people on the city’s housing register. Shehed Albarzanji, 23, moved on to the Ben Street area from Gorton with her partner and two children in late September and is already enjoying the community feel of the area. She said: “It’s everyone’s dream isn’t it, our home is beautiful. The house was ready to just move in and make a home. “It’s taken us a long time to find a home as nice as this. The kids love it – they love coming home to a new house. “There’s nothing not to like – the school is right next door, so there’s no excuse for being late! Empty Homes in the city represent a crucial resource and bringing vacant homes back into use to meet growing housing demand is an important element of the City Council’s housing strategy. Since 2010, the number of empty homes across the city has from 6.5% of the entire housing stock to 4%, reducing the number of empty properties in the city by over 4,000. Less than 0.7% of all properties in the city are classed as long-term empty, and this falls to 0.5% in the city centre. 95% of all empty homes are privately owned and 60% of these are furnished. The Council can collected full Council Tax from empty furnished properties, which acts as an incentive to landlords to bring them back into use. Only around 100 Council-owned properties are empty at any one time (out of more than 16,000 Council-owned homes), which accounts for natural turnover as properties are readied for new tenants. Cllr Suzanne Richards, Manchester City Council’s executive member for housing and regeneration, said: “First and foremost, I would like to welcome the new east Manchester tenants in to their new homes. These are some of the luckiest residents in the city as the first to access the refurbished housing at the Ben Street regeneration area. Wates have done a remarkable job turning these properties into high-quality family homes. “We have a strong track record in Manchester targeting empty homes to make sure they are brought back into use and get the most out of our existing housing stock to help meeting every growing demand. David Williams, Group Director of Assets and Growth at One Manchester, said: “A core focus at One Manchester is to create thriving and resilient communities, not just to build or refurbish houses.